Ghanaian technicians manually sort the beans to determine the most viable for variety trials. Photo Submitted. George Awuni understands food insecurity firsthand. A native of Ghana, in sub-Saharan Africa, Awuni has seen what the scarcity of food does to a community and a nation. He has known hunger and, even though, his mother worked to provide for the family, there were times when Awuni went to bed on an empty stomach. Things have changed for Awuni who is now a post-doctoral researcher in Mississippi State University’s Mississippi Agricultural and Forestry Experiment Station. He is working on a project to transform the lives of those living in his native country through the Feed the Future Initiative, funded by the U.S. Agency for International Development. Awuni and Dan Reynolds, the Edgar E. and Winifred B. Hartwig Endowed Chair in Soybean Agronomy, are part of the team which includes scientists from five institutions of higher learning and 10 governmental and non-governmental research partners. 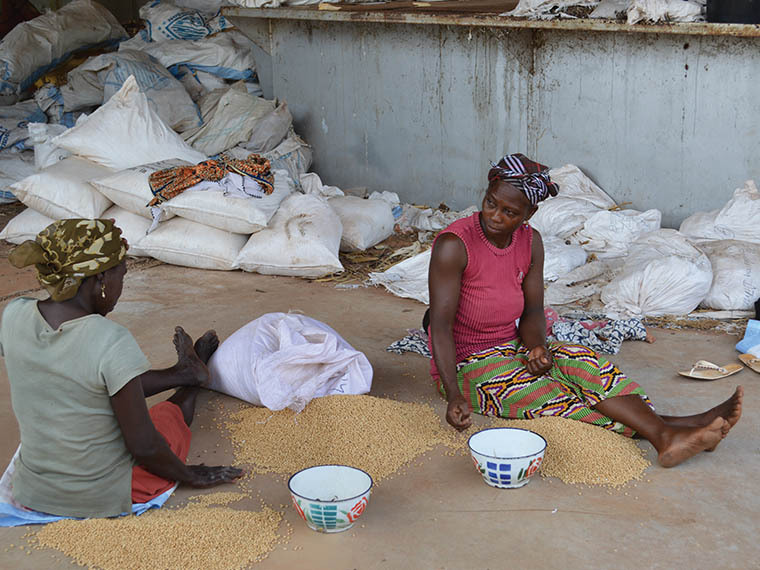 The five-year project will provide the science necessary to enable small-scale Ghanaian farmers to share in the rising demand for soybeans in Ghana. The research will also enable low-resource countries to address problems of food insecurity and protein malnutrition. Ghana is situated in western Africa and its area is about the size of the state of Oregon. It has a population of about 27 million with 75 percent of the population living in the southern portion of the country. In Northern Ghana, there is low rainfall and most of the vegetation consists of savannas dominated by grassland. Trees are sparse. The soil is poor and lacks many of the nutrients needed to raise crops. Northern Ghana is considered a low-income, food-deficit area. The World Food Programme reported that poverty is the leading cause of food insecurity in Northern Ghana. The region has some of the highest rates of malnutrition in the country with four out of ten children malnourished. The average pay for an individual in Ghana is about $3.20 per day, in U.S. dollars. Nine out of ten households farm on small plots of land of five acres or less which limits their production to subsistence levels, Awuni added. He hopes to eradicate hunger in his native country through the Feed the Future Innovation Laboratory for Soybean Value Chain Research. The mission of the project is to boost soybean production across Africa, specifically in Northern Ghana. For Awuni, the idea of working in his home country to solve food insecurity is a dream come true. Awuni worked for nearly two decades in Ghana’s Ministry of Food and Agriculture. During his tenure, he won election to his district assembly (where he was agriculture subcommittee chair), and helped establish and lead a community-based organization working on local development projects. Awuni began working for the ministry right out of high school and was able to attend college at Kwame Nkrumah University of Science and Technology in Ghana while employed. While working for the ministry, Awuni’s desire was to further his education so that he could be part of the solution, helping people out of poverty and transforming lives on a global scale. The opportunity to pursue a master’s degree at Tuskegee University and then work on a doctoral degree at Mississippi State University allowed Awuni to continue his education. Awuni worked on his doctoral degree in entomology under the direction of Mississippi Agricultural and Forestry Experiment Station scientists Jeff Gore and Fred Musser. 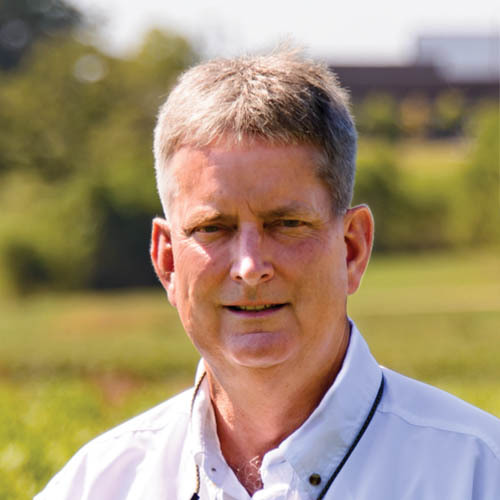 Working at the Delta Research and Extension Center provided an opportunity to become fully immersed in row crop research, in the heart of Mississippi agriculture. As a result of Awuni’s research, new rice stink bug thresholds were recommended for Mississippi rice producers, preventing anywhere from 5-25 percent yield loss in the rice crop. 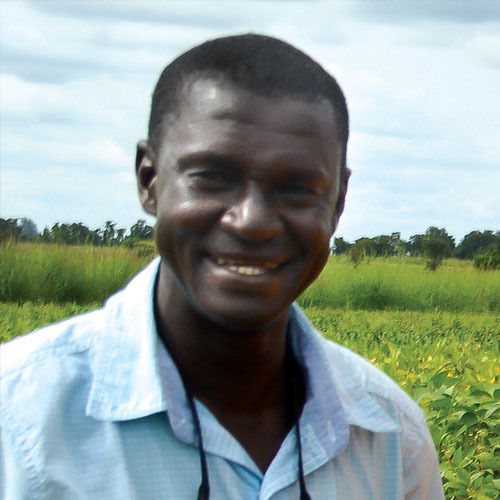 Upon graduation, Awuni was awarded a Norman E. Borlaug International Agricultural Science and Technology Fellowship, a program through the USDA Foreign Agricultural Service which promotes food security and economic growth by training and providing research opportunities to fellows from developing and middle-income countries. When the project in Ghana became funded, Dan Reynolds immediately thought of George Awuni. 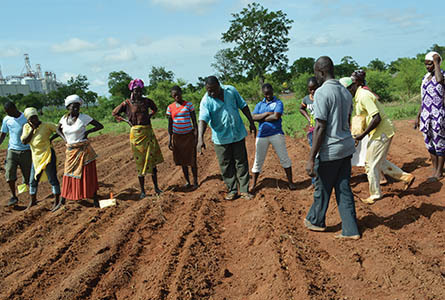 Growers in Ghana prepare fields for planting. Photo Submitted. Awuni was equally thrilled about the opportunity to work in his native land, fulfilling his mission of solving food insecurity globally. His face beams when he speaks of the work he is doing in Ghana and the potential impact it can have on the lives of others. Maize is the most important staple crop in Ghana and accounts for more than 50 percent of cereal production in the country with rice a close second. Ghana is not self-sufficient in either of these crops. All of the crops are cultivated manually and most are not irrigated. Soybean is a relatively new crop in Ghana and primarily used as a rotation crop. The introduction of the soybean is significant in Ghana. Small plot farmers in Ghana harvest about 15 bushels of soybeans per acre which is relatively small compared to Mississippi farmers who averaged 52 bushels per acre in 2014. The research team is in year two of the five-year project. The portion of the project in which Reynolds and Awuni are responsible is the implementation of research and demonstration farms. The first farm was established in 2014 at the Savanna Agricultural Research Institute. The two and half acre farm is one of three spread geographically throughout Northern Ghana and is located near the city of Tamale. Two other farms were established in Bawku and Wa, with each farm only one-half acre. The farm evaluates issues related to germination, planting date, soil amendments, planting methods and varietal performance. The farm also serves as a hub for research related to seed quality, soil improvement and nodulation, a process critical to plant growth in soybeans. The research and demonstration farm approach involves capacity and building as scientists work hand-in-hand with Ghanaian researchers and technicians. Awuni’s research is primarily conducted by hand with very little mechanization. It begins with seeds provided by the Savanna Agricultural Research Institute. Some 250,000 seeds are needed for the variety trials, plus seeds which are not visually inspected are used for the germination test. The germination test involves a seed counter that looks similar to a flat colander which counts out 100 seeds. Seeds are placed on brown paper, wetted and then allowed to germinate for a few days. There were six germination replicates of 100 seed for all 15 varieties tested. Germination is key in crop establishment and out of the 15 varieties, only two achieved higher than an 80 percent germination rate. Soil tests are conducted to determine the micronutrients in the soil. The soil is of low quality with limited phosphorus and other essential nutrients. Mechanical equipment is used to prepare the ground for planting. A pre-emergent herbicide is applied to the fields via a backpack sprayer. Seeding is conducted by hand at a rate of 165,000-220,000 per acre. Once germinated, plants are thinned to 110,000 plants per acre. Weeding is also conducted by hand since untreated seed cannot withstand the use of post-emergent herbicide. Fungi disease was encountered across all three locations, but no fungicide was used for control. The fungi were suspected to be seed-borne. The fields are manually harvested with the plants placed in white bags, similar to cotton sacks. Ghanaians are hired to beat the bags with sticks to remove the beans and then winnow the seeds to remove any fine particles. Yields are tabulated and the technicians are able to take the soybeans home for consumption. Two additional experiments occur at the larger station in Tamale: an evaluation of planting dates and soil amendments. The use of soil amendments was evaluated at the Tamale station. Soil was amended with phosphorus and a Rhizobia inoculum. Rhizobia are soil bacteria that fix nitrogen after becoming established inside root nodules of soybean plants. Seeds are coated with a Rhizobia inoculum before planting. Results of the first year experiment showed significant increased yields. Research plots averaged 30 bushels per acre. The use of phosphorus alone and with Rhizobia increased yield. The study will be replicated and refined this year with an outreach component added. Recommendations will be made after year two of the study is complete. For Awuni, the opportunity to work in his native country and contribute to better lives for Ghanaian citizens is pure joy. intment at MSU, concurs and is thrilled to be hosting the first field day this year. “We’re going to be utilizing the farm to teach others how to disseminate information to the growers in Ghana,” Reynolds said. Through this process, the incomes of small farmers will increase and large volumes of low cost, high quality protein and oil will be delivered to rural and urban communities in sub-Saharan Africa, Reynolds added. Passion At Work: I am passionate about my work, helping smallholder farm families improve incomes and food security on a global scale. Passion At Work: I have the opportunity to not only work with and develop future weed control and agronomic practices, but I also get to help train and mentor our future agronomic professionals.